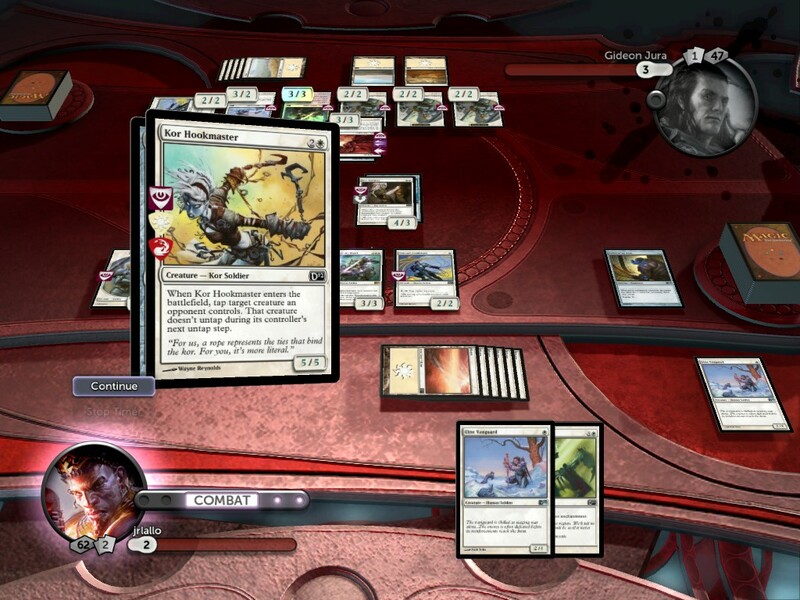 By now, everyone should know about Magic the Gathering. The preeminent collectable card game, it paved the way for the play style and business model that would inspire dozens of imitators. Well, just like the card game, the PC game is ready to deliver new installments from time to time. Is it worth it? Well, let’s see. This here is a Kozilek rookie card. Very valuable. Magic is a game made up of hundreds of gorgeously illustrated cards, so there was never any doubt that you would see some fantastic artwork. Sure enough, the cards are depicted in all of their detail and variety, and plenty of tight zooms are given to allow you to admire them. 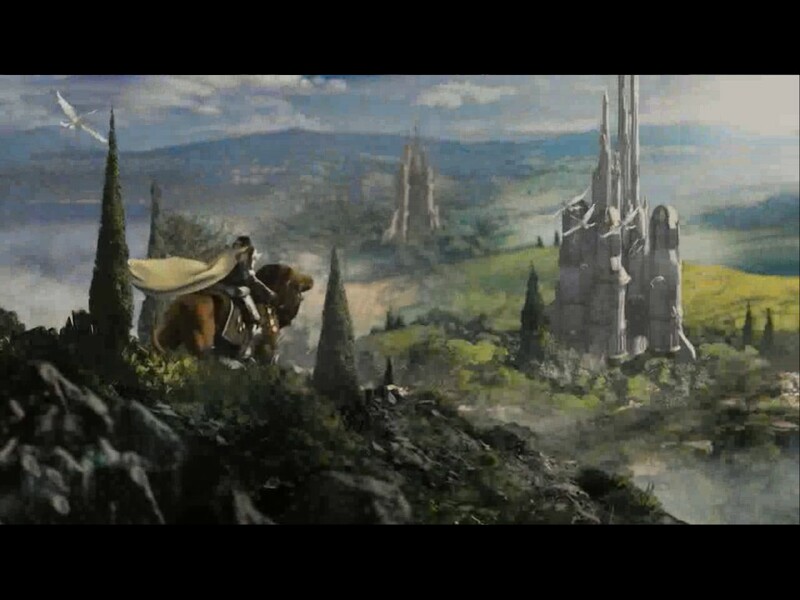 The same level of care is given to the load screen and game tables, as well. Really, in terms of static graphics, I don’t think we’ve seen a game with this much artistic weight. This isn’t a slideshow, though. A video game these days really needs some motion. Frequently, games of this sort will work up a simple 3D version of the creatures on the card, or perhaps a limited 2D animation. 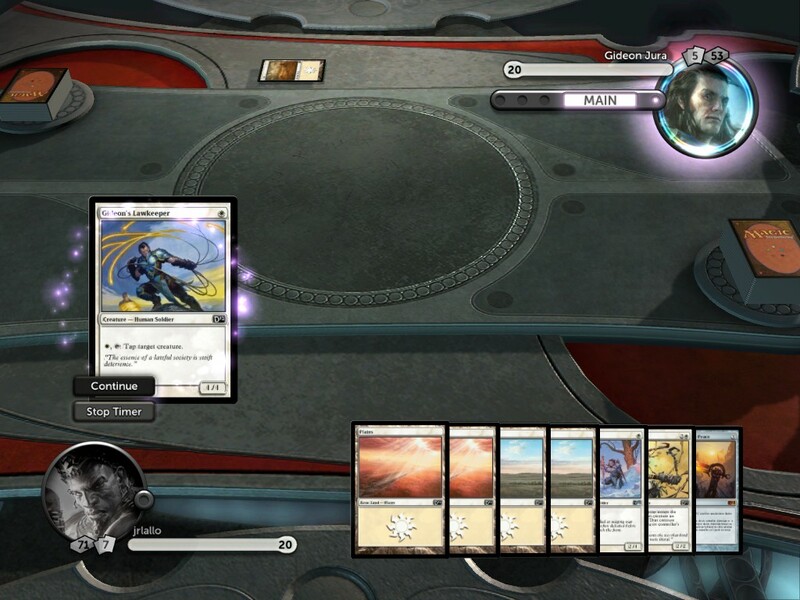 Duels of the Planeswalkers didn’t do that, opting instead for simple overlays that represent the attack type. Clawed creatures slash the other card. Fire breathers heave a fireball. Screen there are screen covering effects to show off widespread spells. 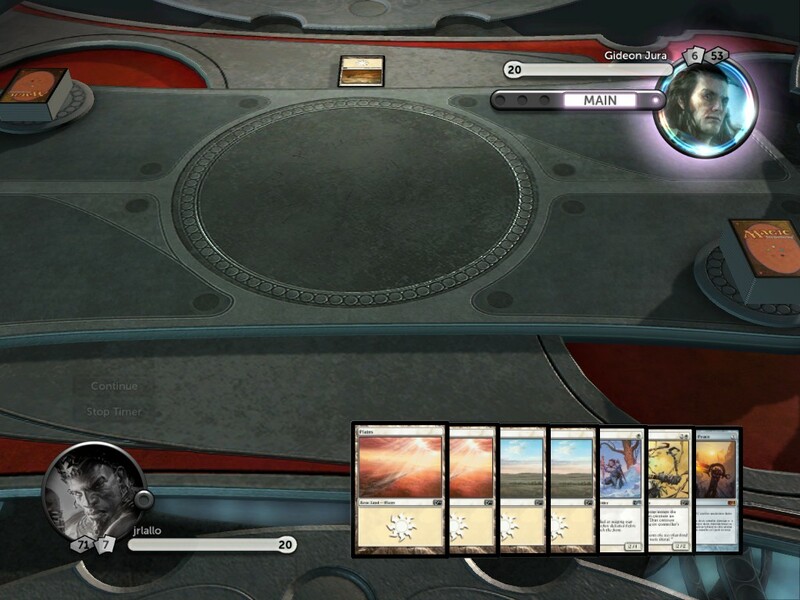 Other than that, cards drifting off of the deck and elevating from the table make up the bulk of the graphical motion. This Kor Hookmaster is so beefed up, it is practically a HookMeister! The useful information is handled fairly well. 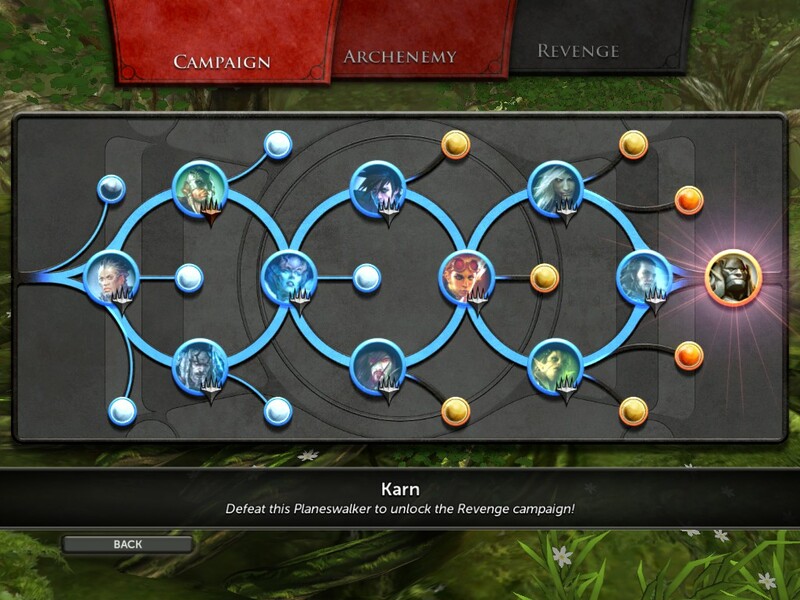 Augmented attacks or defense are clearly indicated with green or red text. 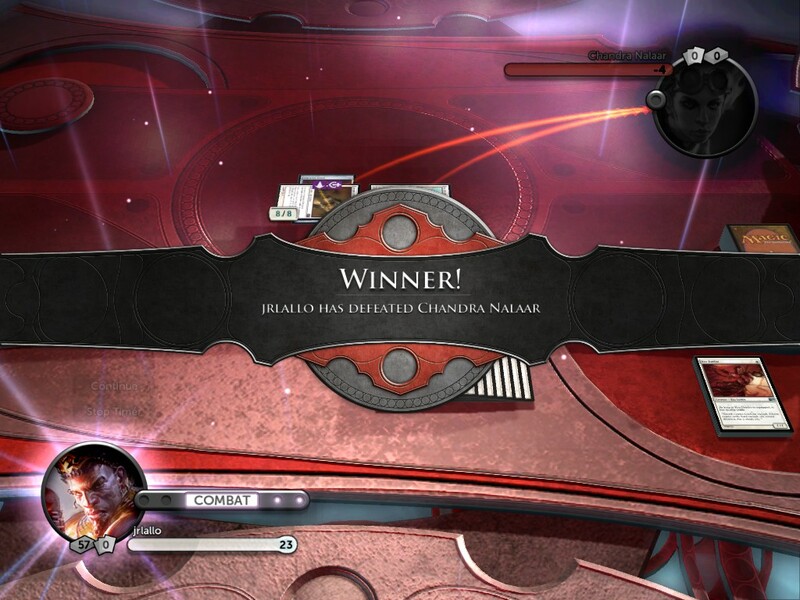 Noticeable auras are applied to cards that can be used at the current stage in battle. Damage totals are clearly represented during the attack animations. 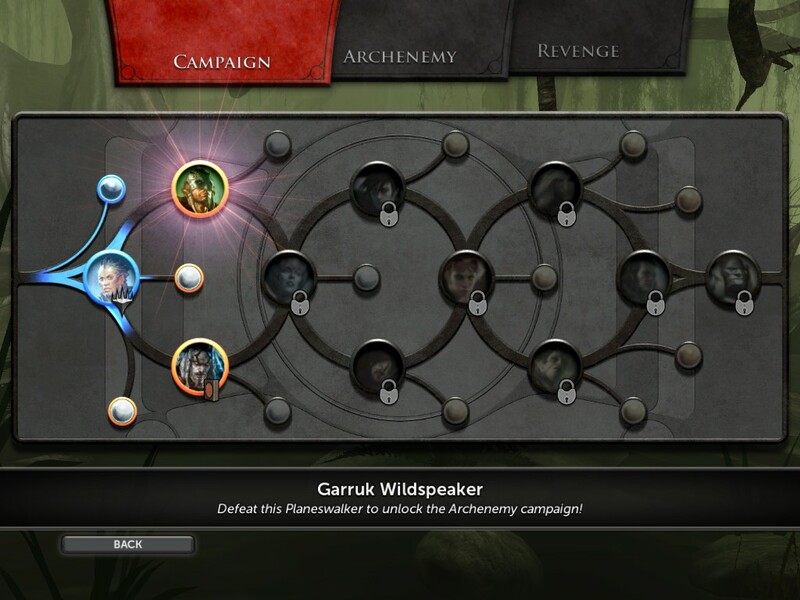 Your health is displayed below your (selectable) player portrait, and shows full numbers along with a meter, making it painfully clear when you’re getting close to defeat with barely a glance. One problem that I had was that the sheer number of cards on the table tended to crowd the board too much to allow the information to be clearly represented. Effects like first strike or trample are illustrated with badges applied to a card, and more than once a card hidden beneath a portrait had a status I hadn’t noticed. Koth is about to feel the pain. 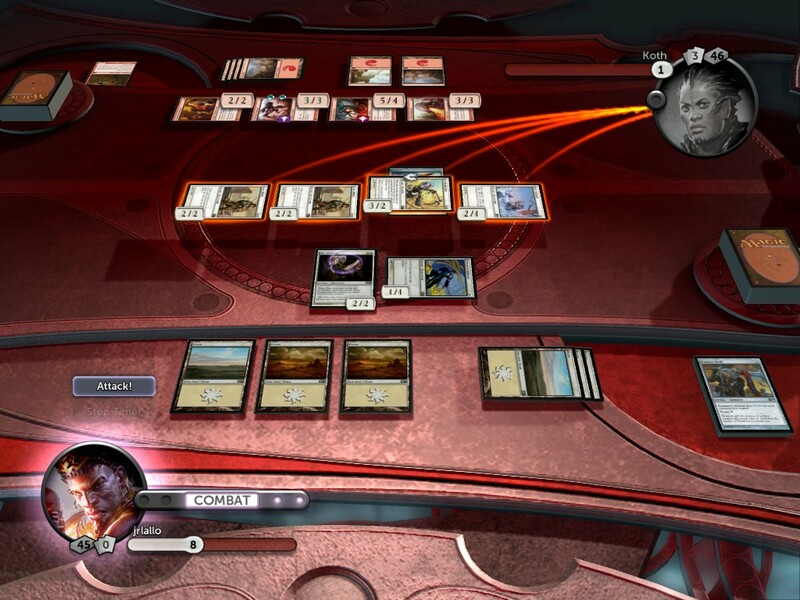 If you aren’t familiar with the gameplay of Magic the Gathering, it is astoundingly complex. Broadly speaking, you assemble a deck made up of land, sorcery, creature, artifact, and enchantment cards. The deck is shuffled and you deal out a hand of seven cards which can be kept or re-dealt for a penalty. Land cards are used to power the other spells, and a combination the cards that you deal out will be used to deal damage to your opponent. Each of you has twenty health points, and once you hit zero, you lose (usually). Creatures can attack or block, and their effectiveness at each is based upon their strength and toughness. That is the simple description of the game, and even at this level of play, it is incredibly strategic. Blocking creatures are still damaged and still deliver damage. If the attacker’s strength is greater than or equal to the defenders toughness, the defender dies. It works the other way around, too, meaning that a suitable defender can kill its attacker. Also, any creature that has attacked is tapped and thus is unavailable for defense, and freshly conjured creatures cannot attack due to summoning sickness (again, usually), so attacks must be plotted out over multiple turns. Imagine chess if the king had twenty hit points and instead of six different types of pieces there were over a hundred. 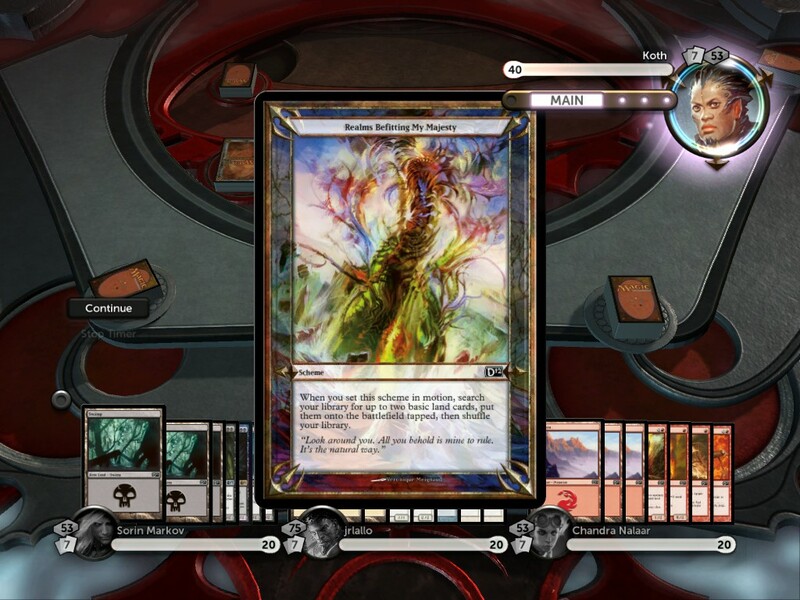 This should begin to give you a picture of the complexity of Magic The Gathering. See? I told you he was going to feel the pain. Stacked on top of this, though, is the fact that very few creatures play as simply as I’ve described. Most have unique behaviors, allowing them to perform actions when they are first put on the field, when they are “kicked” with extra mana at deployment, when they are activated during, before, or after the attack round, or when other specific criteria are met. Different attributes radically alter their handling, as well. First strike gives you the chance to kill an attacker before they can do damage. Flying makes you unblockable to creatures that can’t reach you. There are immunities, death touches, and bloodlusts. Creatures can sacrifice themselves to empower others, devour others to empower themselves, heal their creator, resurrect the fallen… You name it. Now heap on artifacts that can be equipped or activated, enchantments that can be applied, instant spells that can be cast. We aren’t just talking about the usual buffs and attacks, either. There are spells and effects that fundamentally alter the rules of the game. 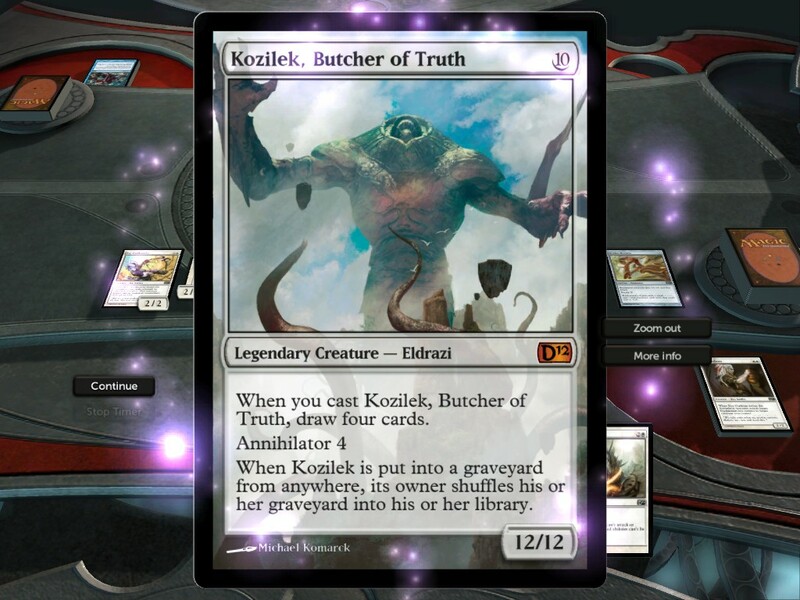 “End the turn with 20 creatures in your graveyard and you win at the beginning of the next turn” is a good example, as it adds a completely new and easily achievable win condition to the game. Wrapping up all of this complexity is a rigidly segmented set of stages to each turn, each of which must be worked through and each of which may or may not allow certain types of actions. 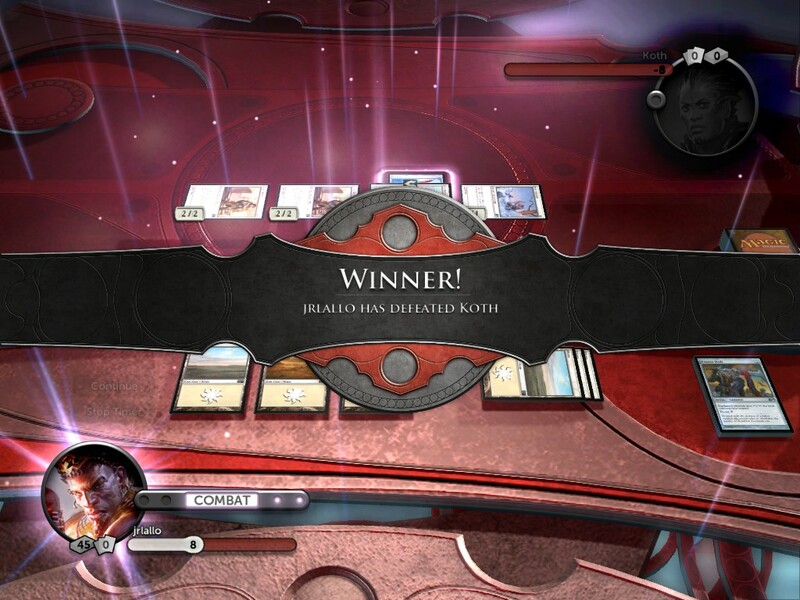 There are two main sequences, plus an attack and defense, and even THESE aspects of the game can change, with cards that double the attack rounds or cause the player to lose a turn. And even THIS doesn’t fully describe the complexity of the game, because there are 3 on 1 game types that double the health of one player and give him “Schemes” that are played once per round to even the odds of having to face off against three people. The game is so nuanced and tricky that the main campaign has “challenges” that reduce a full game into one particularly difficult round of play. You know he's evil, because only villains have schemes. Okay, if you’ve made it through the last few paragraphs, you know that there is a lot to think about. Now imagine that you had to do that yourself, keeping track of, applying, and enforcing all of these overlapping and intermingling rules. I’ve tried it, and my meager brain wasn’t up to the task, which has led to my small collection of Magic Cards going unused. Having a computer to do the rules-lawyering for me has finally given me a chance to thoroughly explore and enjoy the game without frustration and taxed friendships. 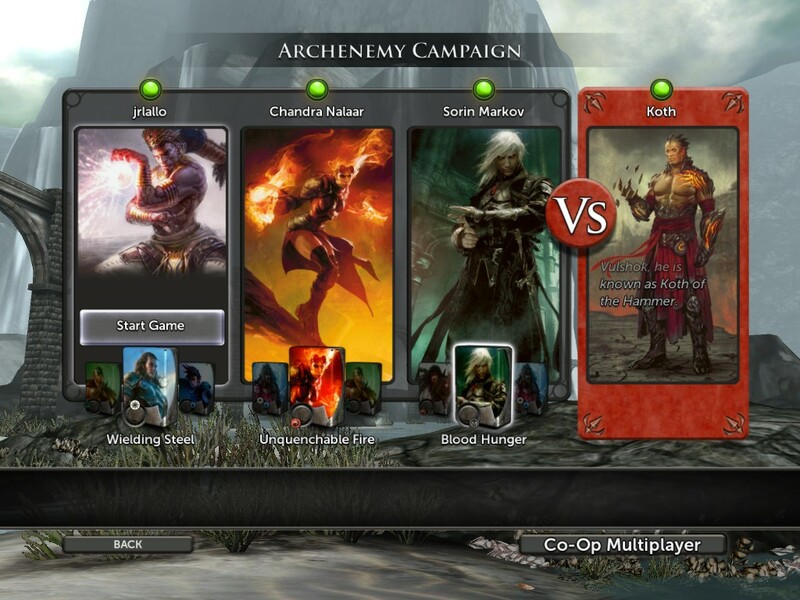 The single player campaign is excellent, having you play against a number of different opponents to unlock decks and additional cards, as well as two additional campaigns that showcase the 3 on 1 battles and difficult rematches. The AI has different levels of difficulty, and was more than enough to give me a decent challenge on the medium difficulty. I didn’t get a chance to give multiplayer a try, but considering the type of gameplay, it can really be considered single player with an unlimited number of difficulty levels. 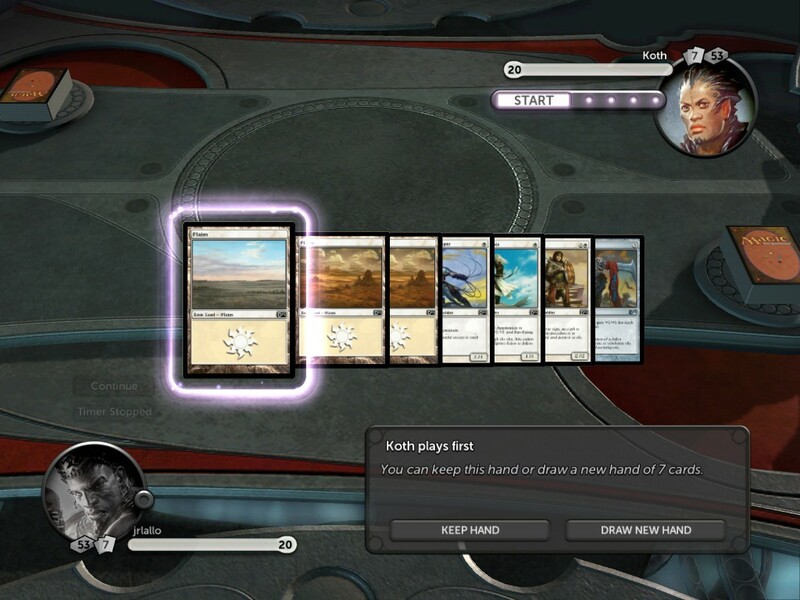 Replay value is through the roof, by the way, because even if you didn’t want to play long enough to unlock all of the cards, the fact that each game starts with a differently shuffled deck means that there can be a tremendous amount of variety even by playing the same match over and over again. I don’t need to describe the sound for this game. Decent epic backtrack with sound effects appropriate to the visuals. Standard fare. I can’t really say anything bad about it. 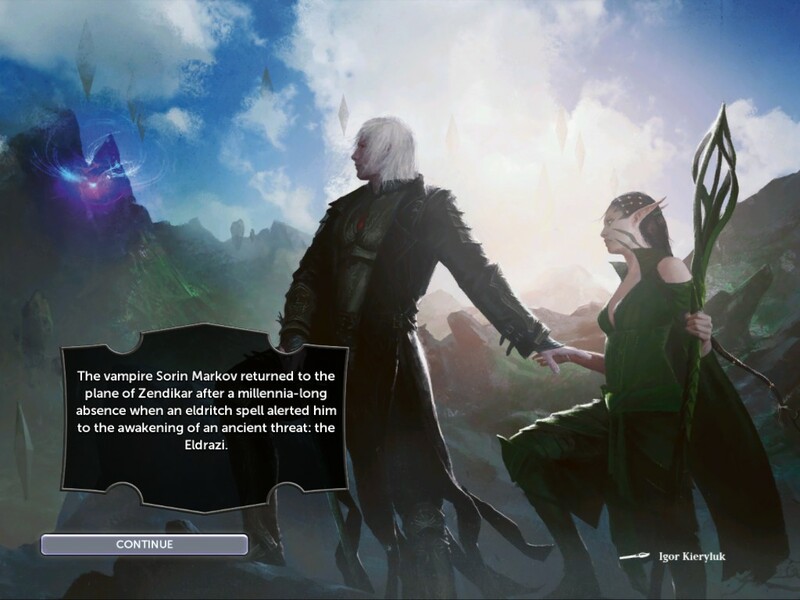 Magic the Gathering has plenty of backstory, and it is fed to you in little doses during the load screens, but there isn’t really an overarching story to the campaign. 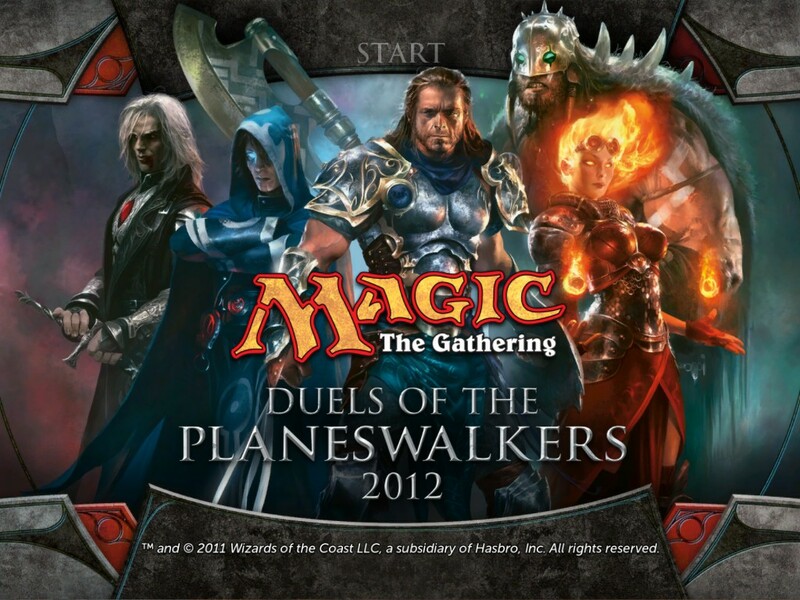 You are a planeswalker, and as the name suggests, you’ll be dueling other planeswalkers. That’s all that matters in context. If you want more, there are tie-in novels to fill the gaps. 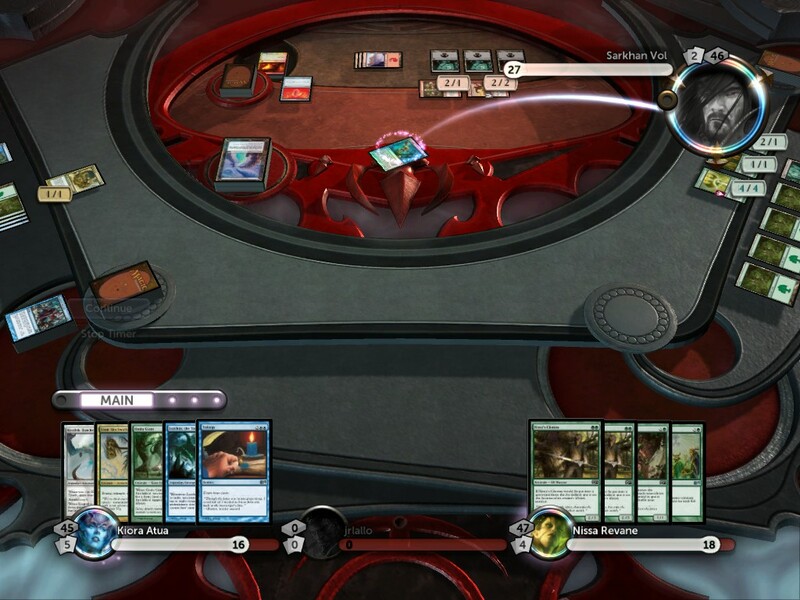 For a long time I have been fascinated by Magic: The Gathering, but I couldn’t really get into it, because I have few friends who were already into it, and thus the onus was always on ME to make sure I was doing it right. This game handles all of that for you, and gives you a veritable fortune’s worth of cards to mess around with. As far as I am concerned, this is the way it was meant to be played. 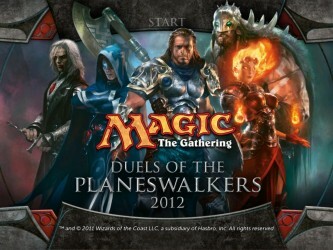 Oh, and you’ll notice that this review was written as though there was never a prior Magic on the PC. I did play its predecessor, and I enjoyed it, as I did this one, but I can’t say for sure that there is enough new to be had in this iteration to justify abandoning the old. If you don’t own the old one, though, do yourself a favor and give this game a try. It will change the way you think about the game. 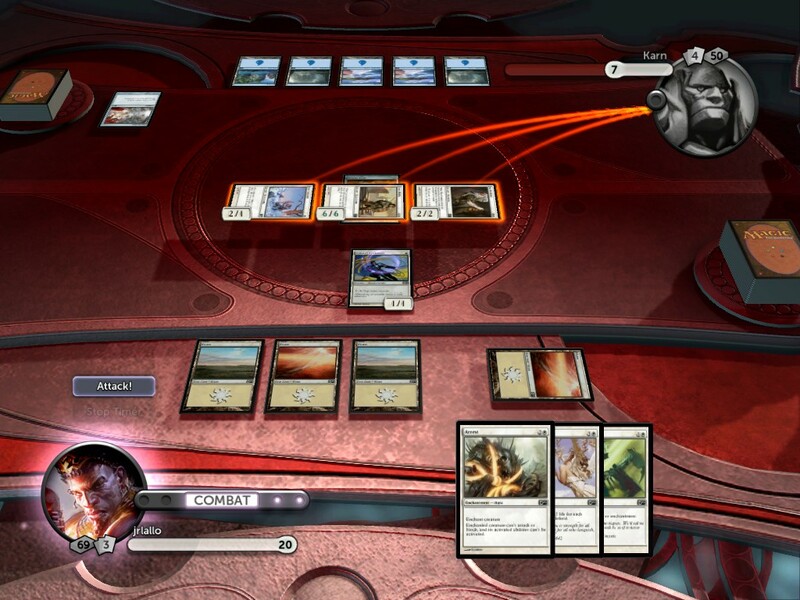 9.1 / 10: This is the way to play Magic The Gathering. Is it me, or does that middle guy look like HHH? That’s all well and good, but I don’t know who those people are. You know he’s evil, because only villains have schemes.